Prof. Gerald Werner (Klinikum Darmstadt, Germany) presents this webinar on the use of IVUS imaging for the assessment of chronic total occlusions. This webinar is intended to educate interventional cardiologists, interventional fellows and related healthcare professionals, and discusses and analyses the role of intravascular imaging during PCI for chronic total occlusions, focusing on the main applications in this context from lesion assessment to stent sizing and optimisation. Professor Gerald Werner has been Director of Cardiology and Intensive Care at the Darmstadt Clinic, a teaching hospital of the University of Frankfurt, since 2005. This post followed a period of 7 years as Professor of Cardiology at the Friedrich Schiller University Jena, where he was Deputy Director of the Cardiology Department and Head of the catheter laboratory. Prior to this, Professor Werner held other positions at the University of Göttingen (Georgia Augusta) including Consultant in internal medicine-cardiology and Head of the echo cardiology laboratory. 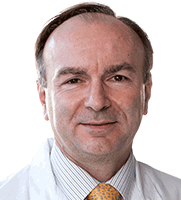 Professor Werner’s research interests focus on the interventional therapy of coronary artery disease, including intravascular ultrasound, chronic total occlusions (CTOs) and collateral physiology, and the applications of lasers in interventional cardiology. He is a pioneer of coronary imaging by ultrasound; his earliest publications in this field date back to 1991, and he was among the first to describe the phenomenon of intramural coronary haematoma, and subintimal vessel pathways during recanalisation of a chronic coronary occlusion. He received the Franz–Maximilian Groedel Award of the German Cardiac Society (GCS) for his work on collateral physiology in CTOs. He has published over 150 original papers and is Fellow of the European Society of Cardiology (ESC), American College of Cardiology (ACC) and the Society of Cardiovascular Angiography and Interventions (SCAI). He is also co-Founder and past-President of the EuroCTO club. Prof. Adrian Banning (John Radcliffe Hospital, Oxford, UK) presents this webinar on the use of IVUS imaging in percutaneous coronary intervention (PCI) of Left Main Coronary Artery Disease. This webinar is intended to educate interventional cardiologists, interventional fellows and related healthcare professionals, and discusses and analyses the role of intravascular imaging with intravascular ultrasound in LMCA PCI, focusing on the main applications in this context from lesion assessment to stent sizing and optimisation. 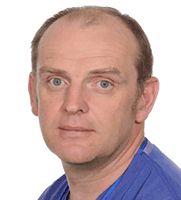 Professor Adrian Banning is a Consultant Cardiologist specialising in percutaneous coronary intervention. He is the President of the British Cardiac Intervention Society and previously held the position of Divisional Director of Cardiology, Cardiothoracic and Vascular Surgery at the John Radcliffe Hospital in Oxfordshire. He also works from his own private practice at The Manor Hospital also based in Oxford, UK. He began his career as a Senior Registrar at the John Radcliffe University Hospital in 1995, he became a consultant cardiologist in 1999 and subsequently Clinical Lead and Divisional Director in 2010. A research pioneer, expert lecturer and advisor, Prof Banning is an established author who has written many scientific papers and textbooks in this area.